Cooking Delights: Just like my mumma used to make them! I have been craving peanut butter cookies for a while. 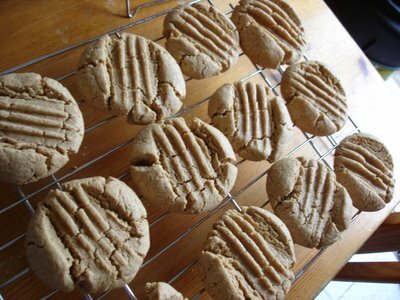 Lately I have been having memories of my the peanut butter cookies my Mom used to make us when we were kids. I was getting totally nostalgic for these cookies. Dreena Burton's Peanut "Better" Cookies to the rescue. These are from Vive le Vegan! These were fantastic. I loved the use of maple syrup in these cookies as a sweetener. I also used spelt flour. I love spelt flour in cookies. I think because the spelt flour is so elastic it makes for a nice and chewy cookie. Dreena you sure know how to create a delicious cookie... not just like my mumma used to make them, but tastes just like I remember them! mmm..I'm going to have to make those. Any cookies with a lot of maple syrup in them turn out SO good! Megan! Aren't you in Ottawa running yet? Yes, you should definitely make them as a marathon day snack! Yum! Yum! Yum! Your photo looks fantastic! Peanut butter cookies are among my favorites. I haven't made Dreena's yet, but after your review, I think I'll have to. Dreena's cookies are always to die for. You should definitely give them a shot! This is one of our favorites, too. Everything looks SO GOOD here, dragonslayer! I found your blog thru Megan's wonderful blog. I like yours and hope to visit more often!